A tradition of natural science books continued in the middle ages from ancient Greek and Roman writings through the early middle ages, when writers such as Isidore of Seville (6th century) and Bede (early 8th century) write treatises on cosmology and calculation of time. Later expanded at Fleury and taken further still by Abbo of Fleury, who lived at Ramsey in the 10th century and was an important intellectual link to the continent, the tradition flourished in Britain's monasteries. To these natural science books belong a tradition of diagrams which incorporate Christian cosmological doctrine into classical theories on the structure of the heavens and earth, uniting geography, physics and computation of time to demonstrate the harmony of creation. Books such as this one (which is in two separate manuscript fragments in the British Library) would have been textbooks for training monks and churchmen. This book was made at Peterborough, as shown by the annals written on its first pages. The normal way of representing the world in the Middle Ages was a circle divided in half horizontally, and the lower half divided in half again, vertically. The dividing lines for a 'T' shape. At the centre, here written across the middle, was 'Jerusalem'. Above was 'Asia' (labelled at the very top), in the lower right was 'Affrica', and to its left 'Europa'. A number of place-names are marked on this example: in a small circle in Europe is Italy ('Italia'), next to this in a rectangle 'Roma'. 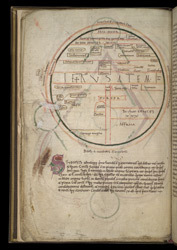 At the extreme left-hand side, partly protruding outside the circles, are Britain ('Britannia'), Scotland ('Hibernia'), and the island 'Thile'.